Look at your workplace, and you will see a computer or some other digital screen on every single desk with a pair of eyes staring at them. It is no wonder that eye fatigue has become such a common complaint these days. So, this article will focus on discussing the best blue light blocking glasses you can use to protect your eyes. Most jobs nowadays require a computer screen. Even jobs that traditionally didn’t involve any computers now have screens. For example, some warehouse companies list computer skills as a requirement for its job positions. Even jobs in the retail sector involve staring at a computer screen. As computers and other electronic devices such as smartphones have become a ubiquitous part of our daily lives, their impact on our health is becoming increasingly evident. However, the blue light from a digital screen can disrupt our sleeping patterns, degrade our eyesight and so on. How do we deal with the seemingly deceptive menace of the blue light? It is simple. That is through the use of the best blue light blocking glasses. 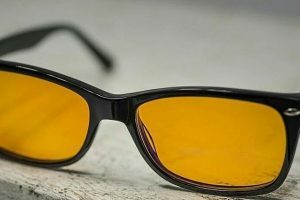 As we understand the harmful effects of blue light, it’s no surprise that the number of computer glasses on the market is increasing. So, how do we find and get the best possible glasses? 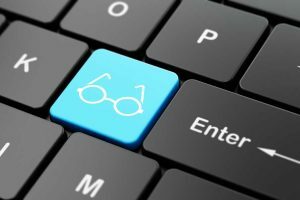 Let’s take a look at some of the key elements in choosing the perfect computer glasses. There are a number of special-purpose lens designs for computer glasses. The most straightforward option is the single-vision lens. This lens is specially modified to provide the greatest possible comfort while you are in front of a computer screen. It achieves this by enhancing your optical focus and increasing the field of vision. Another popular option is the progressive occupational lens. This lens offers a more excellent intermediate zone relative to the regular progressive lens. This ensures that your time in front of a screen is as comfortable as possible. Lastly, we have the occupational multifocal lens. This lens offers an even larger near and intermediate vision than regular bifocal or trifocal lens. They can even be tailored to your particular computer vision requirements. In order to provide maximum possible comfort, the lens should include an anti-reflective coating, also known as AR coating. AR coating can make a huge difference in our vision as it eliminates the possibility of reflection of light causing unnecessary strain on your eyes. Another aspect of this lens is that it is photochromic. It is a type of lens that can protect your eyes from the high energy associated with blue light rays. Blue lights have greater energy than most other lights and can unnecessarily cause our eyes to strain. Lastly, computer glasses also have a tint on their lens, mostly yellow but not necessarily. The slight tint can reduce glare from overhead lighting as well as enhance contrast. The EyeKepper Vintage Computer Glasses are computer glasses that offer a degree of comfort that is completely unparalleled among its peers. In addition to the comfortable fit, these glasses are also quite durable, which also make them practical for daily use. You would want these frames if you’re looking for comfort, style and at the same time, protect your eyes from blue light rays. The glasses are made using a patented design for the protective lens. As a figure of speech, this lens will obliterate all forms of blue light rays emitting from your computer or smartphone screens. The glasses protect your retina from the harmful effects of blue light and make sure your eyes don’t feel strained halfway through the workday. This pair of computer glasses come with a microfiber cloth for cleaning the lens without worrying about scratches. It also comes with a hard, zippered case so you can keep your glasses safe and ensure they last as long as their lifespan. The frames are made out of durable plastic and are registered with the FDA, ensuring high-quality plastic frames with spring-loaded hinges and blue-light blocking lens that will protect your eyes even after spending hours in front of a screen. The glasses will ensure that you get a full night’s rest even if you use your phone while in bed. Eliminates glace and its ability to strain the eyes. Blocks out all of the blue light from being absorbed by the eyes. It is available in a single frame design. It comes with turquoise tints matching its turquoise colored frames. Black Computer Reading Glasses 0.00 is offered as a pack, which contains two pairs of glasses. 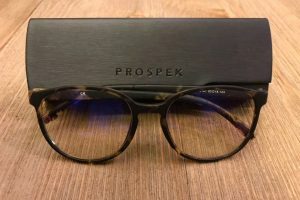 The option to buy two pairs of glasses is an excellent decision since computers and digital screens are not exclusive to our workplaces. We also use computers and tablets at our home, especially in bed, which is when we are in most need of protection from blue light. The black-colored frames go naturally with its slight blue-tinted lenses. These blue-tinted lenses are just as capable of blocking blue light as the yellow-tinted lenses, but look much better. The lens will help protect your eyes from glare, UV rays and most importantly blue light. The specially designed lenses will ensure that you would no longer have to suffer from strained and fatigued eyes. These glasses offer the perfect solution to computer-screen-induced headaches. They will help prevent blurry vision that we experience after spending hours staring at a screen. It will also keep your eyes fresh and rejuvenated after a long day at work. But most of all, you’d look pretty stylish wearing these computer glasses. It will protect your eyes from blue light rays. It prevents eye fatigue and computer-related headaches. Thick, boxy frames might not appeal to everyone. Cannot be used as general purpose eyeglasses. These computer glasses are like sunscreen for your eyes. Just like sunscreen protects your skin from harmful UV rays, these glasses protect your eyes from harmful blue light rays and UV light from computer screens. It is the best way to prevent retinal degeneration while still looking your best. Last but not least, these glasses have been engineered with patented Sure-Flex Comfort Spring Arms, which ensures maximum possible comfort for its users. Cyxus Blue Light Filter UV Blocking Glasses are an anti-eye strain glasses for computers and other electronic devices. The frames are made out of hardened and durable plastic, and the lenses are scratch resistant, ensuring a highly durable pair of computer glasses. Cyxus glasses can block up to 99% of all UV and blue light rays. They are an excellent pair of glasses for working on a computer or reading on a tablet. It can also be a good choice for gamers who spend numerous hours in front of a screen. The glasses will ensure that you can have a restful night’s sleep even after spending a few hours watching your favorite tv shows right before going to sleep. The frames have a classic round style, a design that is in fashion these days. It is available in two different colors namely black and tortoise. The lens has a slight tortoise-colored tint as well, which works wonderfully with both the black- and tortoise-colored frames. 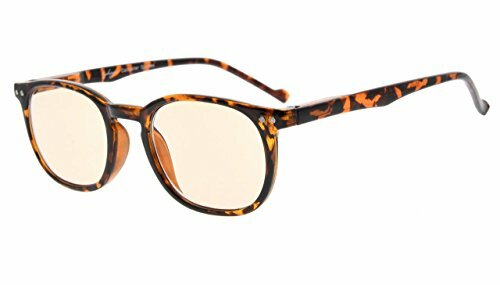 If you intend to purchase these computer glasses, you would be happy with the timeless and fashionable look and enjoy their classic vintage style. The frames are available in two different colors. Have a unique tint, which will appeal to those who avoid generic styles. It blocks 99% of UV and blue light rays. Offers the best way to avoid disrupting your sleep cycle and internal clock. The computer glasses cannot be used as sunglasses or for other purposes. The tortoise tint might not suit everyone. The computer glasses are ideal for those who are particular about their looks and want to protect their eyes from excessive strain. It offers an optimum way to relieve headaches caused by excessive time spent in front of a computer screen. The lens is checked by independent lens testing labs to ensure the authenticity of the lens and its effectiveness at filtering out blue light rays. 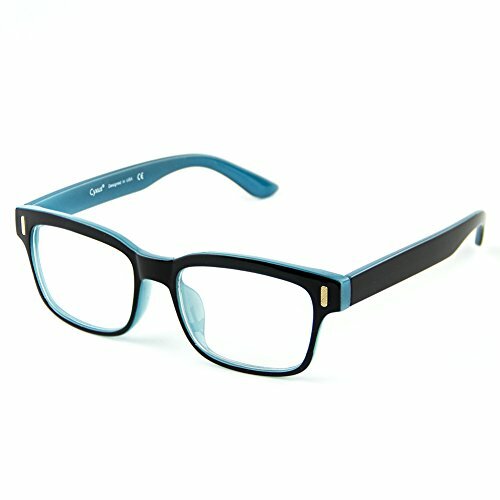 The J+S Vision Blue Light Shield Computer Reading Glasses are computer reading and gaming glasses with 0.0 magnification. It offers anti-blue light protection as well as protection from UV rays. The lens used in the glasses is certified high-definition lens. The frames have a classic rectangular style. It is made out of durable but comfortable plastic, which ensures style, comfort as well as longevity. The frame is available in a glossy black color that makes them stand out. The rectangular frame is ideal for both men and women, and the size ensures a decent field of vision. The temples are loaded with springs, which allows for a comfortable fit for all types of head sizes. The glasses offer an easy and straightforward way to minimize your exposure to blue light, which can cause excessive fatigue and stress. The high-quality lens filters out all of the blue light rays and allows us to focus on the task at hand. As the lens filters out the high energy rays, only low energy blue light is left, which has no harmful effects on your eyes. Rectangular frame design is suitable for both men and women. The large design ensures maximum coverage of your field of vision. The spring-loaded temples ensure a comfortable fit for big and small heads. These highly practical glasses don’t offer much in terms of style and fashion. 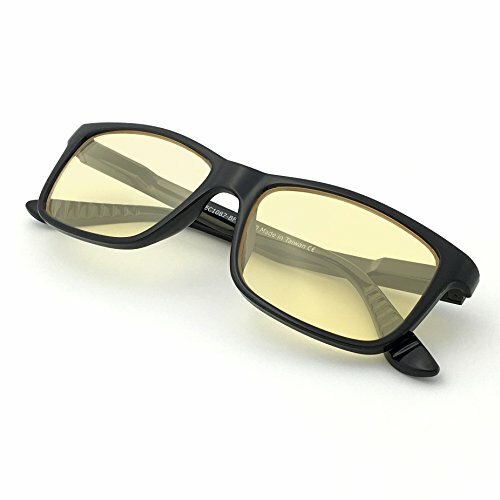 It has the traditional yellow tint associated with computer glasses. This pair of glasses features heavy duty lens, which has seven layers of anti-reflective coating. More importantly, the lenses have undergone hydrophobic treatment, ensuring maximum eye protection even in the harshest low light conditions. 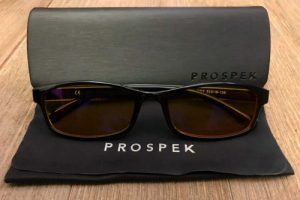 The Prospek Kids Computer Glasses offer eye protection for our kids. These computer glasses are intended for children aged four and above. Since the new generation of kids is brought up with electronic devices, it’s no wonder that they’re even studying while on computers and tablets. Therefore, it has become increasingly important to provide them with a protective eye gear that not only appeals to them but also protects their young eyes. These computer glasses offer precisely that since they have a design that would appeal to most kids that age. The glasses contain a premium quality lens, which is designed to block all high energy blue light rays from passing through the lens. It protects young eyes from unnecessary strain and allows them to develop naturally. The lens is made using a patented technology and is tested by an independent, third-party lens testing lab. 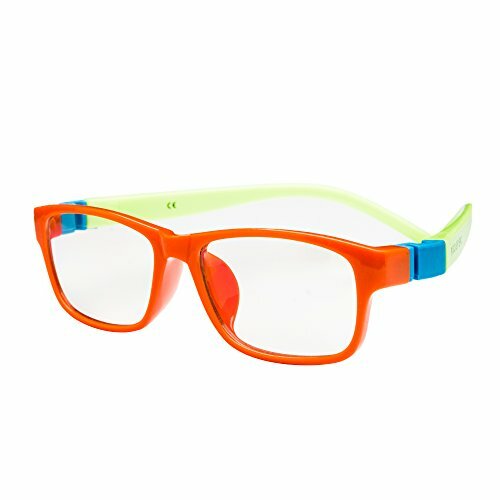 The frames have a number of fun colors that would be attractive to young children. But more importantly, the lens has the minimal possible tint to ensure minimum color distortion for the young and still developing eyes. The glasses come with an extra pair of hands, and the frame has an expandable size so it can last a long time even as your kids are growing. Bright, fun colors for kids. Extra durable frames can take a beating. Adjustable size to fit your kid’s face even as they grow. Very low lens tint means low degree of glare protection. Can only be used by children aged four and above. The computer glasses won’t just appeal to a kid’s taste but are also built to withstand the rough use that most kids will put their glasses under. The lens is fingerprint resistant so that it won’t causes headaches related to smudges. It is simply the perfect computer glasses for our kids. What are the Common Symptoms of Computer Vision Syndrome? Is a Prescription Needed for Blue Light Blocking Glasses? 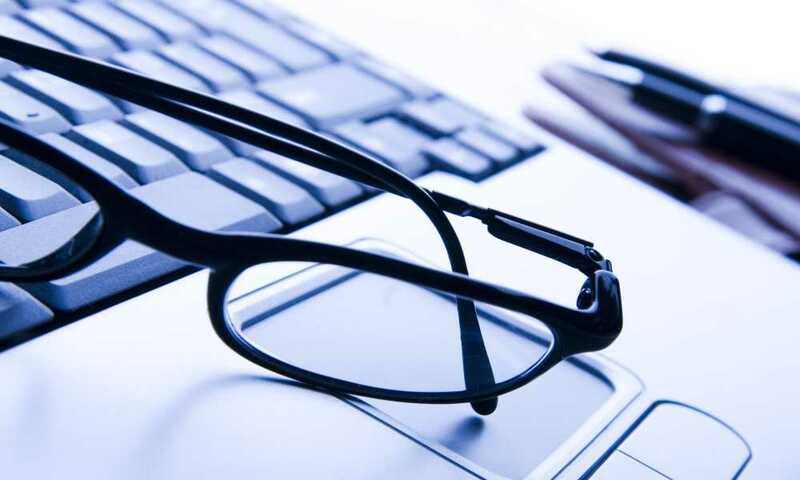 Most computer glasses are available without the need for a prescription. However, if you have weak eyesight and would like your glasses to act as blue light blocking glasses as well, you might need a special prescription that will give you blue light protection along with your vision-correcting glasses. Computer glasses have a special lens that is capable of filtering out high energy blue lights emitted from digital devices such as computer screens, smartphones, and even fluorescent lights. Since these lenses filter out the harmful rays of the blue light, they allow your eyes to focus with greater ease, reduce eye fatigue and eyestrain, and improve contrast. What is Blue Light and Why it is Harmful? There are different types of lights, some visible and some invisible. When we talk about lights, we are usually talking about visible light spectrum. Within the light spectrum, blue light is the closest to UV light—the harmful invisible light. On the opposite end of the visible spectrum, we have red, which is next to the harmless infrared. Red light has a long wavelength but low energy, whereas blue light has a short wavelength but high energy. Since blue light has a high energy, it can potentially be harmful to your eyes especially if your eyes are exposed to it for extended periods of time. The thing is, blue light itself is not harmful, but constant exposure can cause premature degeneration of your eyes. All electronic devices, as well as LED and fluorescent lights, emit blue lights. As we are increasingly spending a higher number of hours in front of a screen, we need to protect our eyes with computer glasses. These computer glasses can filter out harmful, high energy blue lights and protect our eyes. Can Computer Glasses Prevent Computer Vision Syndrome? Yes, a pair of blue light blocking glasses can indeed relieve many of the symptoms associated with CVS. Computer glasses, unlike regular glasses, are designed specifically for the distance our eyes view a computer screen from. It helps our eyes focus, and it also improves contrast, which prevents unnecessary strain on the eyes and reduces the risk of other computer-related vision problems. 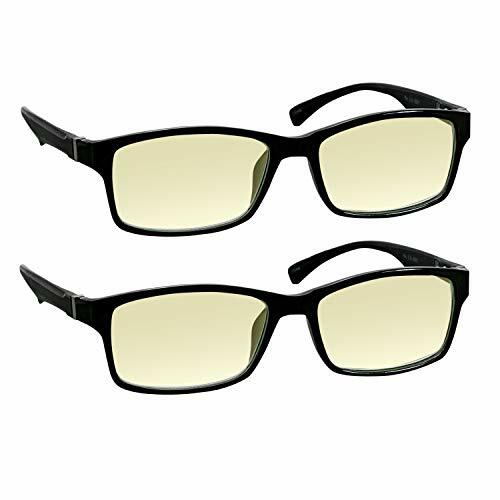 Out of all of the different computer glasses we’ve looked at, which would be the best blue light blocking glasses? Well, the thing is all of these glasses will get the job done, that is, protect your eyes from harmful blue lights. Without taking the design and looks into the mix, how do we conclude? There is one aspect of all these computer glasses that could potentially make the difference; that is independent third-party testing. 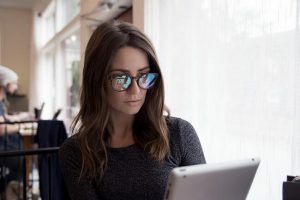 Since there are still no accrediting agencies for computer glasses, we need to rely on third-party testing labs, which will guarantee if these glasses actually do what they claim to. But before we go any further, we are compelled to mention that one of the glasses that we reviewed were meant for children aged four and above. 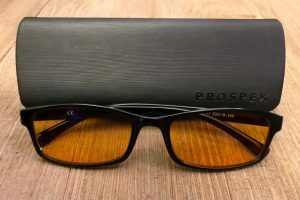 Since we can’t compare children’s glasses to adult’s glasses, we won’t take the Prospek Kids Computer Glasses into the equation. Since Cyxus Blue Light Filter UV Blocking Glasses has each and every one of its lens tested by an independent third party tester, it is safe to say that these glasses are one of the best choices we can recommend for protecting your eyes.